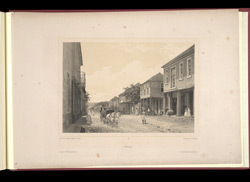 Lithograph from Adolphe Duperly's work 'Daguerian Excursions in Jamaica' showing a view of Market Street in Falmouth. Falmouth was created in the parish of Trelawny in 1790 to replace the old capital Martha Brae, which had limited access due to its river location. It was named Falmouth after the birthplace of the Governor of Trelawny. The parish council bought land from Edward Moulton Barrett and meticulously planned the layout of the new town. The plan included thirty streets, along which were built two-storey houses. Many of the houses were bought by merchants who would use the ground floors as shops and live in the rooms above.